I am still dabbing at the tears in my eyes, and the stomach cramps from laughing so hard. Never, in my life, have I laughed out loud so much while reading a book! 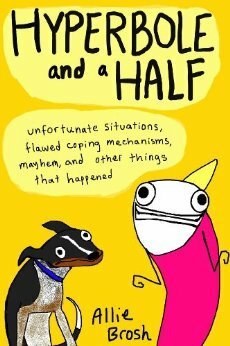 I am a newbie to Allie Brosh's blog, but as soon as I spent just a couple minutes on it, I was hooked. When I received this in the mail as a gift from Simon and Schuster, I was jumping for joy and dove in right away. I couldn't wait any longer to start reading! I devoured Hyperbole and a Half. I laughed and I cried(only because I was laughing so hard). My fiance started donning glassy eyes because I kept reciting segments of this book to him; And because I would keep him up at night from my loud cackling laughter muffled giggles. Go out and get this book now! Read it from cover to cover, and then keep it close by you for always. Whenever you need a laugh, grab it and open it to a random page. This book is a treasure to have on my bookshelves! That cover alone makes me want to read it. On my way to go find it now! Oh man! It is so awesome! Let me know what you think of it!